Home › Business Relationships › Recent shopping experience reinforces the need for communication to go both ways! Recent shopping experience reinforces the need for communication to go both ways! We all have a certain level of expectation for how and when we “think” people should communicate with us. A recent NL blog post entitled “Have you mastered The Art of Professional Communication?” gave tips on how to communicate professionally, but a recent experience sparked my conscience and made me want to add one more: Don’t avoid communicating! About a month ago, I went into one of my favorite stores and was told that an item I wanted was no longer in stock in stores, as it was being phased out. The salesperson suggested I go online to see if there was one available online. I immediately went online and found the item was still in stock there. I ordered quite a few, because I was afraid there soon would be none left online, either. I was also enticed by the $1.00 shipping bonus they offered. After completing my transaction, I got a confirmation email of the sale, then another notification of my anticipated ship date, followed by an email saying “It’s Shipped.” After the delivery date, I received another email asking me to complete a small survey about my shopping experience. Of course, I didn’t respond to it, because the experience was over and satisfactory. I got my product! The online store has continued to send emails asking me about my experience. They are little friendly reminders like “Don’t forget…” and “Help make us better by…” And until today, I have been steadfastly ignoring them. Today, while trying to ensure that NL clients and law firm members have resolved communication issues, something set off a spark in me. By my not completing that 30-second survey about my recent online shopping experience, I was responding in the same way that my customers sometimes respond to me about NL service matters. They receive what they asked me for and check it off their list. Forgotten is the communication I need from them asking if what they received was enough to satisfy the open service matter with NL, so I can check it off my list. So like the online shopping site, I’m continually sending friendly reminders, “Please advise” requests, and so on. So my new tip is, “Remember, communication is a two way street!” Communication is like a sentence; it has a beginning and an end. 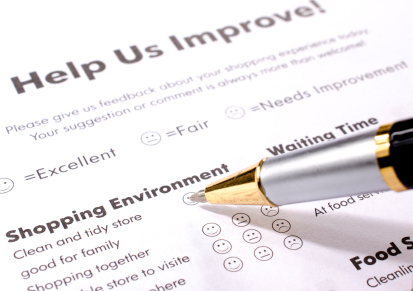 In my example, the “end” is a response to a shopping satisfaction survey or a reply to an email that will let me know your communication issue has been resolved. I resolve to respond to others as I would like them to respond to me! ‹ Thanksgiving: One of my favorite days of the year! What a great blog, Leslie, thank you for the friendly reminder. Often in life we too often take the time to complain, but don’t take the time to note how we feel the service could have been better or make a point to note when a service is outstanding. I think of all the servers that have served my family and in my head I thought, “what an outstanding server”, but because a manager didn’t approach me during my visit to ask about my experience, I wasn’t able to commend the server to the powers above and just left a larger tip. I can think of numerous times I had a bad experience, and thought to myself they should probably change this so others don’t have the same experience, but I never took the time to let them know how they could possibly resurrect the situation. How can anyone improve if they don’t even know the problem exists. I didn’t read this blog and think, “I have to make a note to complain more”, but instead felt; how can I give feedback to better situations for that vendor &/or situation.